If you enjoy traveling and camping in an RV, then you know how important it is to be prepared for all emergencies. It’s easy to think about emergency supplies and the like, but how often do you actually think about your battery? While most people simply plug their RV in at their destinations, there are times when you might need or want to rely on battery power for an extended period. It’s been said that the best medicine is preventative, and when it comes to RV camping, this means making sure you never have problems in the first place. This is why it’s necessary to outfit your RV with the best, most reliable equipment, including the right 6 volt battery. There are a lot of great batteries to choose from, so read on while we show you some of the best options available, as well as our pick for best overall choice. 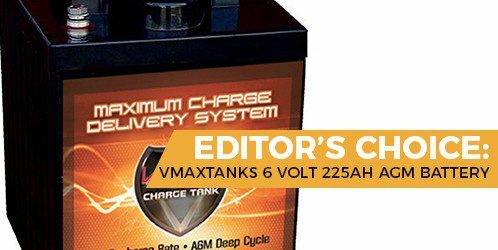 The first battery on our list is the VMAXTANKS 6-volt 225Ah AGM battery. We picked this high performance deep cycle battery because it is designed to work -- and work well -- no matter where you may end up. This battery is built to give your RV a strong and uninterrupted flow of power, while also allowing you several different options in how to use and charge it. With 6 volts and up to 225 ampere hours you can supply continuous power to your RV for up to 20 hours -- and if you choose you can even couple it to another 6V battery to increase your overall voltage to 12. This battery can operate under extreme conditions, with an operating temperature range that extends from -4 F all the way up to 140 F. This means that, for most situations you find yourself in, you can rely on this battery to work and keep your camping experience optimal. This battery can also recharge under harsh and unforgiving extremes, as well, with a standard AC charger -- although solar and wind chargers are also able to get the job done. One of the best things about this battery is that it is designed to be maintenance-free and long-lasting. As an AGM battery, there is no need to check the specific gravity of this battery or add water -- which leaves you more time to play and less time to worry about your battery, which has a float service life span of about ten years or so. There are so many things to like about this battery, starting with its maintenance-free AGM build. The strong amperage is also nice, and the many recharging options available mean you should never have to worry about running out of power! The rugged durability of this model is also why this batter gets a 5! While the 8mm terminal posts are standard and can let you hook up to a variety of things, it would be nice if other terminal options were included. Also, 72 pounds is a bit heavy for a standard 6v deep cycle battery. The second battery on this list is the Trojan T-105. This popular battery is a more economical deep cycle battery that still manages to deliver all the power you’ll need. Built with Trojan’s patented “T2” technology, this battery delivers an increased output, a longer life than other flooded batteries and high performance. Rated at 6 volts and delivering 225 Ah, you can fully rely on this flooded lead acid battery. And, like other 6 volt batteries, you can even take multiple batteries and sequence them together to provide even more power for a longer span of time. As mentioned above, this is a flooded battery, which means the plates are fully submerged in an electrolyte solution, which requires regular maintenance -- unlike AGM batteries. As long as they are well-maintained, however, these batteries are still able to last for an average of five to seven years (although many T-105s have lasted even longer) and provide strong and reliable power for that whole time. This is one of the most popular deep cycle batteries on the market, simply because it offers a fair, reliable, economic solution. However, if you’re not looking for a battery that requires a little bit of maintenance, then the T-105 might not be the right battery for you. The size of this battery -- small, lightweight -- means it’s simply easier to work with than the other batteries. Depending on where you’re housing your battery, sometimes it can be a tight fit. With this one, you don’t have to worry about that so much. What’s better? It stays small and yet delivers the same amount of power as the larger batteries on the market! Another thing to like about this battery is the terminal options. Trojan really made it easy to connect to just about anything. The flooded battery can really be a drag. While the time and skill required for maintenance is really pretty negligible, the consequences for poor battery maintenance can be costly, with several years of battery life lost. The third battery on this list is the NPP NP6-200Ah 6V 200Ah AGM battery. This is another AGM battery, like the VMAXTANKS, which means that it is considered a “dry” battery with very little liquid on the inside. These batteries tend to last a little bit longer than flooded batteries, and are generally easier to take care of since they require very little maintenance overall. Unlike the VMAXTANKS battery, though, this battery only delivers 200 Ah, which means that you are looking at a downgrade in performance and total output. Depending on how many devices you are looking to run, and your complete power needs, a lesser Ah like this could potentially mean sacrificing some of your comfort down the road (literally) as devices compete for current. Like other AGM batteries, you can expect a long life of about ten years with the NPP NP6-200Ah, and much of that will be relatively easy, with little or no care put into it. This battery can be easily charged through a variety of methods, including AC charging, solar and wind, so you should never find yourself stranded or in need. It installs easily and can be linked to other batteries to increase output and capacity, which can help alleviate some of the potential issues that come with less amperage. Again, AGM batteries are much easier to use, and that is a consideration that needs to be taken seriously! The 200Ah rating is really on the low side, and that needs to be a factor when considering your battery. You want to RV in style -- not having to worry about whether or not you’re using too much power! Also, the terminal options are pretty meager compared to, say, the Trojan battery above. The Crown CR235 is another flooded battery, similar to the Trojan T-105. What sets this one apart, however, is the strong amperage this battery delivers, with a rating of 235 Ah. Depending on your needs and how much current you draw in your RV, this means that this one battery can go pretty far -- and even farther when chained to other similar batteries. Crown boasts that this battery is built with the “thickest lead plates in the industry” which help contribute to a stronger power output and a longer battery life. This battery also comes with both post and screw-type terminals to allow you to connect to your RV and other applications in whatever way is most convenient for your situation. 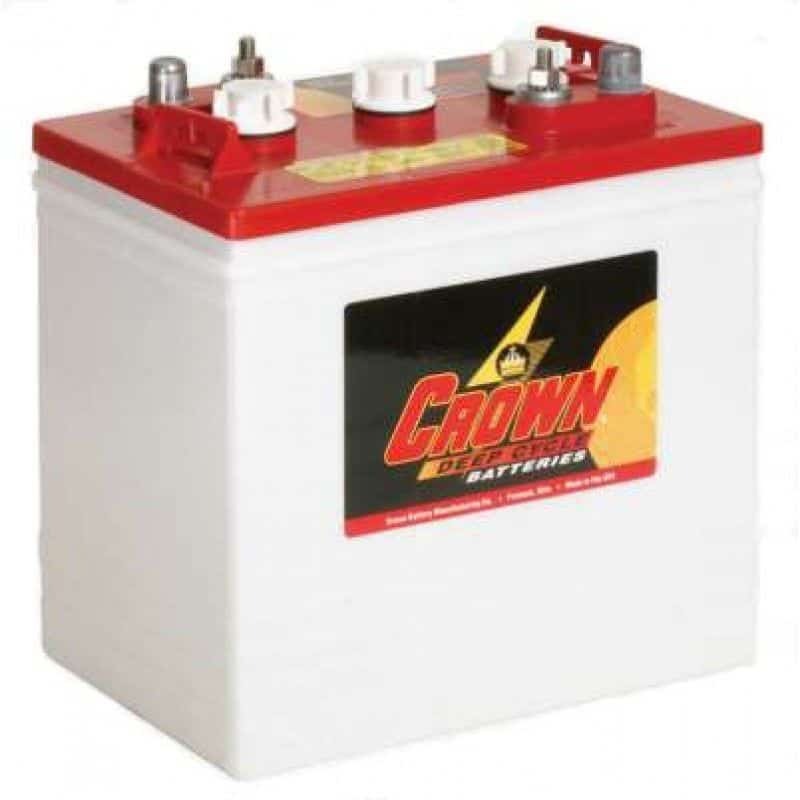 As a flooded battery, though, this battery does need regular maintenance in the form of adding water and testing the specific gravity of the electrolytes -- all things that, if not done properly, can severely impact the performance and life of the Crown CR235. Users who are not willing or able to put that amount of effort into this battery might be better off looking elsewhere. The good news about this is that Crown has tried to make this easy by adding what it calls a “PROeye indicator.” This is basically just a feature that allows you to check the water levels with one quick glance, rather than having to open it up to test. I love the 235Ah rating. This is a high-performance battery and that rating shows it! The PROeye indicator is also a nice touch. Crown knows that maintenance can be a hassle, so they’ve taken steps to make it easier. The lighter weight of this battery is also nice and makes it easier to work with, and the two styles of terminals give you some flexibility. While the PROeye indicator helps, this is still a flooded battery, so make sure you’re keeping an eye on it at all times! Our final battery is the Lifeline Marine AGM Battery - GPL-4CT. As the name implies, this is another AGM battery, which is a “dry” battery that requires very little in the way of maintenance or upkeep. This one has a slightly lower Ah rating than the VMAXTANKS, at 220, but this amount of amperage is still able to delivery plenty of power. In fact, this battery can last anywhere from 6 hours at 25 amps all the way to 28 hours at 8 amps. That’s over a full day of use, if you’re not drawing too much out of it! Lifeline batteries certainly have their share of supporters, and for good reason: this is a brand known for designing and producing high-quality batteries that never let you down, and the GPL-4CT fits right into that history and reputation for craftsmanship. With a life expectancy of at least 10 years, and plenty of recharging options including AC chargers, solar and wind, you can be sure you’ll get plenty of use out of this battery as long as you adhere to proper battery procedures. All in all, the Lifeline Marine AGM battery is another great battery to consider when trying to decide which choice is best for you and your RV. The low-maintenance of an AGM battery is always nice. And Lifeline is a name in the industry that commands respect. While it’s not that much under, 220Ah is still not as powerful a battery as you might need. Also, the lack of terminal options make this battery potentially harder to work with. When it comes right down to it, all of these batteries provide great options. So, how can you know which one is right for you? There are several things to consider. Deep cycle batteries, such as the ones listed here, are batteries built for long, continuous use. Therefore it’s important to get one with high ratings in features such as amp hours and durability. Price is another important factor to consider. While it’s true that “you get what you pay for” it’s also true that some items are just priced higher than others for no apparent reason, so it’s important to do your homework and read the specifications and ratings. Another factor that you should take into account is maintenance. While all batteries require some form of maintenance, including following proper charging and discharging rules and procedures, there are certain types of batteries -- AGM, in this case -- that are simply easier to use, and create less hassle and worry. For all of those reasons, when it comes to buying the right battery, we recommend the VMAXTANKS 6V 225 Ah AGM battery. While this can be a bit pricey, it is certainly worth the money and will give you every penny’s worth. If you are a little more budget-conscious, the Trojan T-105 is a great second choice. We hope this little guide has helped you make the right choice. Happy Rving!